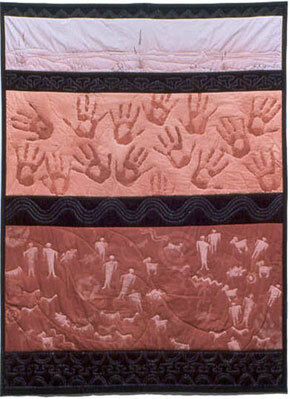 This early series of art quilts from 1989 to 1993, combining various paint and stencilling techniques with patchwork, applique and quilting. Each piece expresses the awe I feel in the presence of ancient Man-made patterns, signs and symbols on landscapes. Roll the mouse over each image for further information.